Kevin Fraser has captured on video what Lindsay and I have shared together aboard “Third Aye.” Although we plan to be aboard a larger boat in the near future, the spirit of minimalism and contentment with living on a sailboat will remain the same. 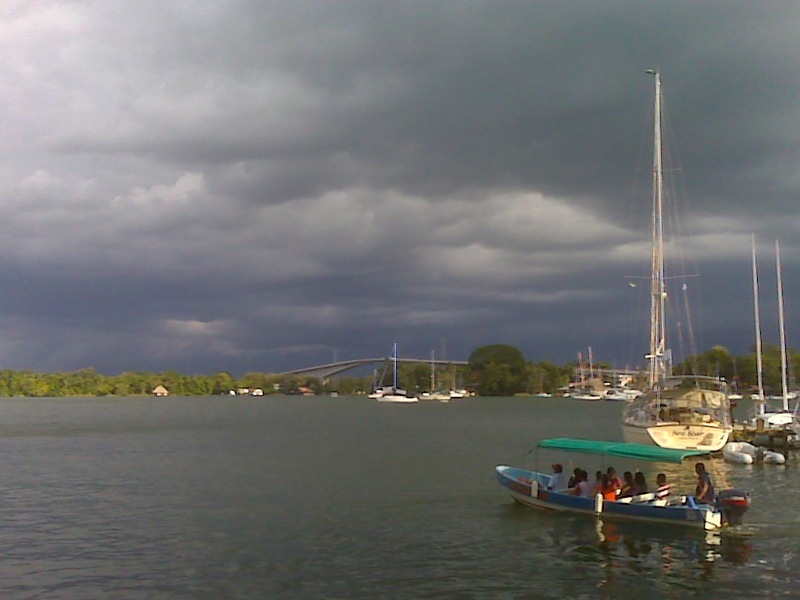 Life here on the Rio Dulce is pretty chill… but I’m not talking about the weather… that is sizzling!! 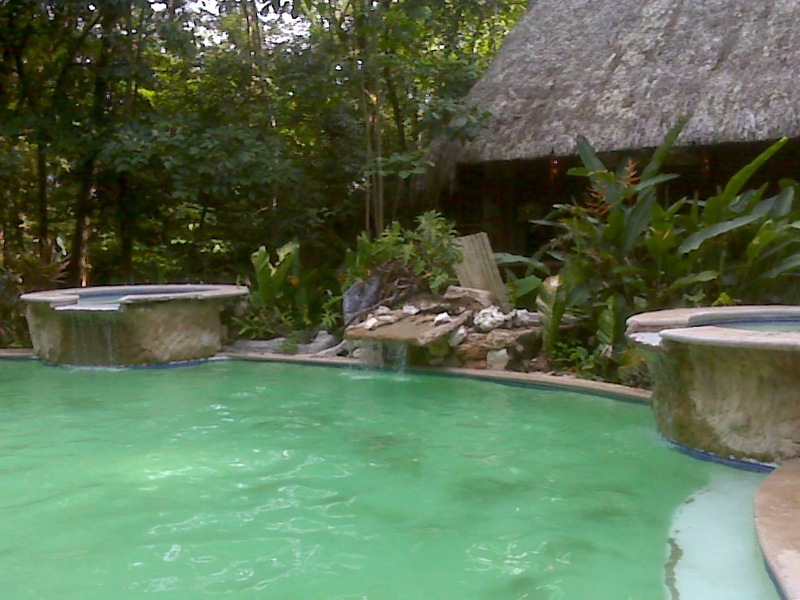 I had been warned by another cruiser who spent last summer here and said they spent most of their time in the pool at their marina… but, having survived chartering these last few months in Belize, we thought we’d be ok… HA! The bridge does look cool… and generally you can’t hear the traffic… but every once in a while a truck with next to no breaks, and certainly no break pads screeches it’s way down our side into Fronteras. We’ve been enjoying our time hiding out on board Third Aye with our wonderful air conditioner (thank you Jim for helping to sort that out! 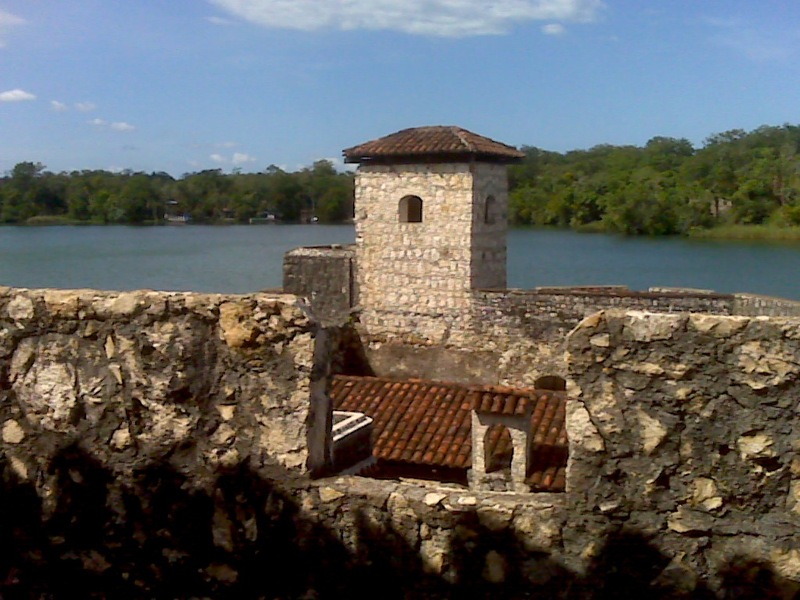 ), but we try to make ourselves get out a bit here and there to avoid going totally doolally!So, the other day we headed off in our little put-put of a dinghy to check out one of the few tourist attractions locally… El Castillo San Felipe. 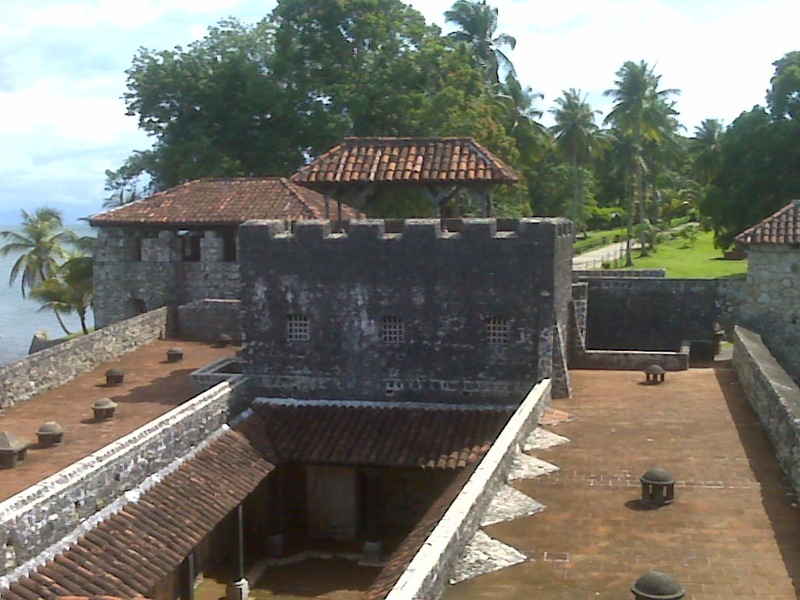 Apparently (as you probably can’t actually read below) was built in the 16th century, originally as a watchtower, to look out for pirates. 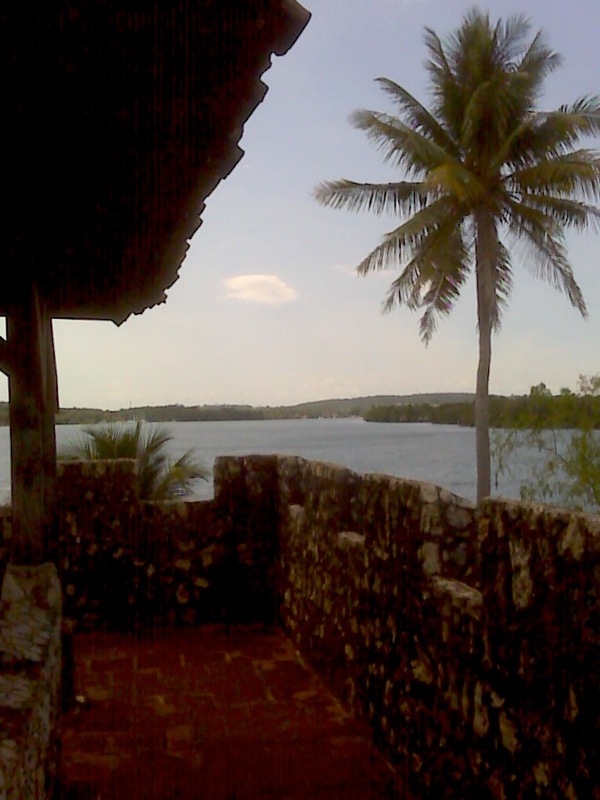 Over the next century or so, many pirates sailed all the way up from the coast here to Rio Dulce and so the Spanish needed to prevent them getting further in land here at the narrows and stop them from pillaging local towns. Over the next couple of centuries the pirate activity came in waves of force and so they built and rebuilt the place until it became a full-on, miniature castle – yes! 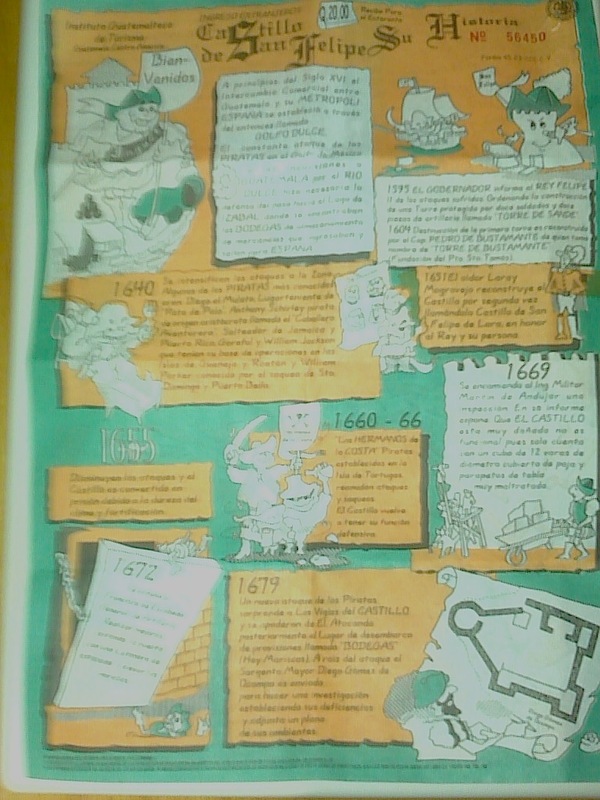 it was a very cool little castle but really quite compact and bijoux!! It’s really a maze of little (they must have been short and rather skinny Spaniards stationed here) corridors, rooms, stairwell and turret with cannons. Quite elaborate and very cool by the looks of it – if anyone had infiltrated one part of it, they would never have survived beyond the next corner where a sword or rifle would have undoubtedly been waiting for them. to find a pool to cool off in. That day it was courtesy of Hotel & Marina Tijax.. not a bad setting for the pool, but the most expensive cokes in the area at a whopping $1.30 each!! Outrageous! So it was back in the dingy.. And time for Happy Hour! Bye Bye Belize… Hola Guatemala!! Tadd had to completely dismantle our dinghy’s outboard, soak every little bit of it in penetrant and oil, and painstakingly coax each bit back to life… we had left the sturdy 1964 Johnson sitting on the back rail of Third Aye the whole time we were working … didn’t even try to start it once… ahhhh… so won’t ever do that again. But in Tadd’s expert and determined hands, the dinosaur once again came to life and gave us hope that we would be able to make it ashore on our travels. We did our best to enjoy a rather soggy Placencia Lobsterfest and the World Cup matches while Tropical Storm Alex washed through. Fresh lobsters on the grill in Placencia, Belize! It was no where near as bad as some expected and we had a few good nights out and another hiding out in our cozy little Third Aye. What we thought would be the biggest hurdle before departure turned out to be a formality. 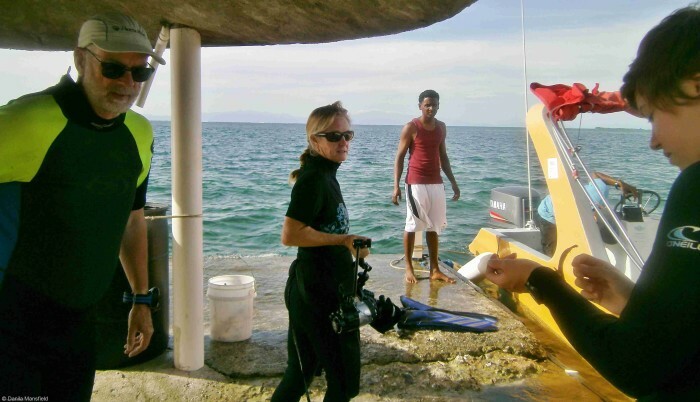 We were required to temporarily import Third Aye into Belize and therefore hand over a bunch of cash to Customs. They had assured us and our customs broker, Mr. Billy Valdes, that the money would be safe and sound, waiting for us in a treasury account when we came to leave… but every other sailor that we talked to while in the country offered little hope or confidence that the cash would turn up when we asked for it… ugh! But as it turned out, Billy was a star!! He not only got us our money back, but he convinced customs to cut us a cheque before we cleared ourselves and our boat out of the country (normally they say you have to physically leave before you can claim your money back!! Huh!!??). So all we had to do, in the end, was turn up in Belize City and have Billy drive us around to pick up the cheque and stuff. He rocks!! So, all that was left was to stock up on some food, diesel and ginger ale… and do a run around all the local banks to change Belize dollars back into US dollars, as they won’t let you change more than USD 250 at a time… definitely time to move on!! 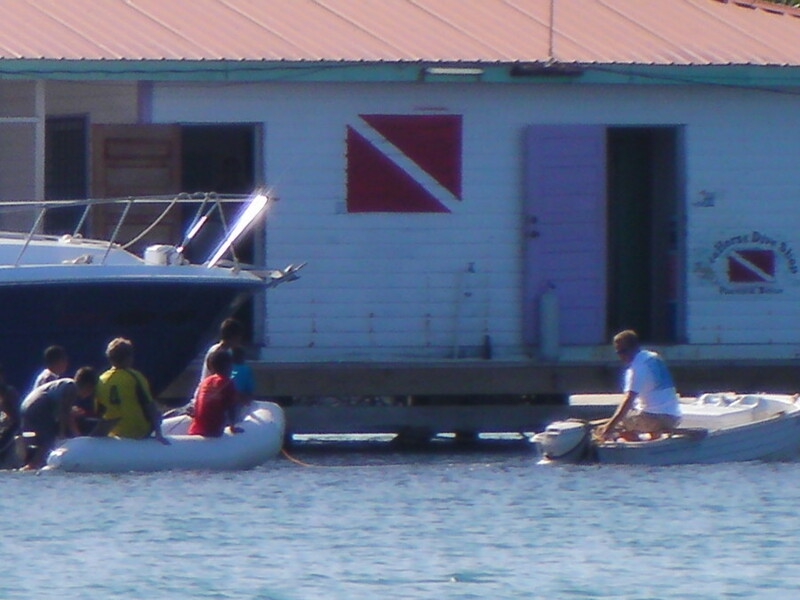 First thing on Thursday July 1st, we untied from the dock and set sail SE to Tom Owens Caye. We spent a few days hanging out with our friends Polly & Roland at Reef Conservation International, and doing some diving. It was a fabulously relaxing few days with some amazing dives, tagging along with the students that Polly was simultaneously teaching PADI Open Water, Rescue and Divemaster to!! What an amazing lady!! But by Sunday it was time for us to head off and on to Guatemala. We had checked out of Belize on the mainland and couldn’t check into Guatemala until Monday morning, so we just sailed west and anchored for the night off Cabo Tres Puntas in Guatemala. Then early Monday morning we sailed across to Livingston, to official enter Guatemala. With the help of the infamous Raul, we expedited our entry and within a few hours we were on our way up the Rio Dulce… out of the saltwater and into the sweet! 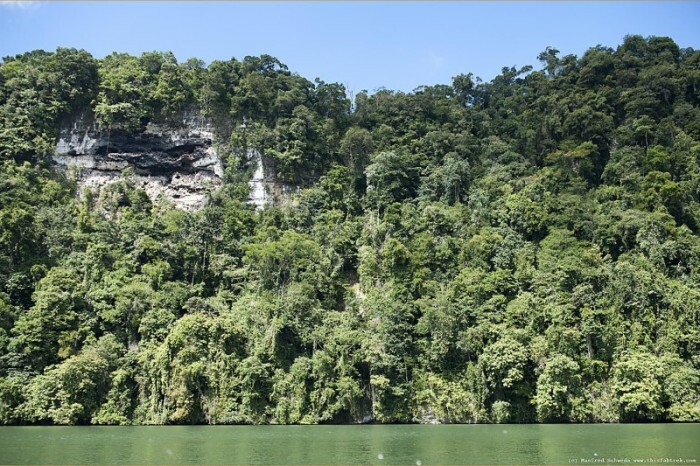 The trip up river was pretty spectacular… through a gorge, where the towering limestone walls were draped with green robes of rainforest plants that clung to the steep rocks. There were many herons, egrets, pelicans and butterflies buzzing around, keeping us company as we slowly made our way inland, against about 1kt of current. Absolutely stunning!! The canyon walls of the Rio Dulce River are astounding. Winding our way through the gorge… the walls were much higher than they look in the pics! Tadd driving us up river… keeping a close eye on the depth sounder for errant sand bars and submerged pilings… not just a jaunt through the gorge when you have a draft of over 4′. After a couple of hours we emerged into the wide waters of El Golfete… we considered stopping at a marina here for the night… but when we set our anchor in Texan Bay and realised the only wind was that which we had be creating ourselves… we opted not to sit and cook until sundown, and headed back out again and pushed on to our marina at Fronteras. 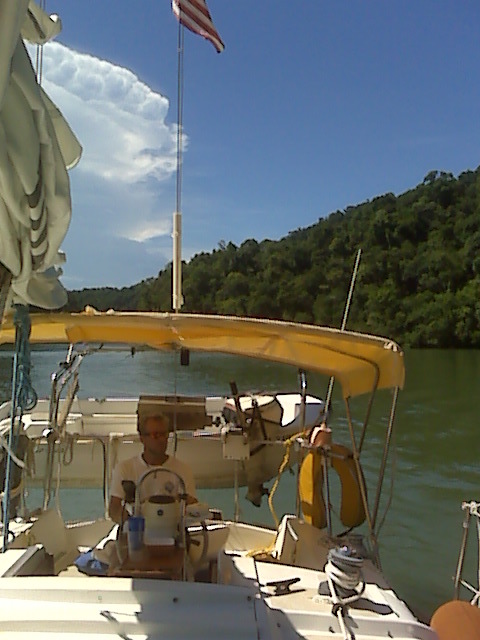 It is probably the cheapest marina on the Rio… but as the only one who responded to our emailsand had space available for us… it is now home… and actually, as we check out the other places around here we are very happy with our choice!! Q: How do say Legal in Belizian? A: Just Pay first. Then you can say whatever you like! We had been cleared through customs for four months now. The time was upon us to get our boat “Third Aye”, temporarily imported. We had been warned that this was coming, it’s not an easy process and it could be expensive. Our manager, Peter, was confident that he had a way around the system, and planned to get our boat licensed with the Coast Guard at the same time as “Stess”, our Tradewinds 45 foot catamaran. In order to meet him and “Stess” at the inspection area, Lindsay and I set off for Belize city, sailing “Third Aye” due North on January 16th. We had two weeks off charter, which meant eleven days off work. We planned to get the official business done as soon as possible, then enjoy a casual sail back down from Belize City, visiting the many lush cays along the way. We finally got ourselves sorted and provisioned enough to sail away by about eleven o’clock in the morning. We should have left much sooner. The sailing was slower than we remembered,. 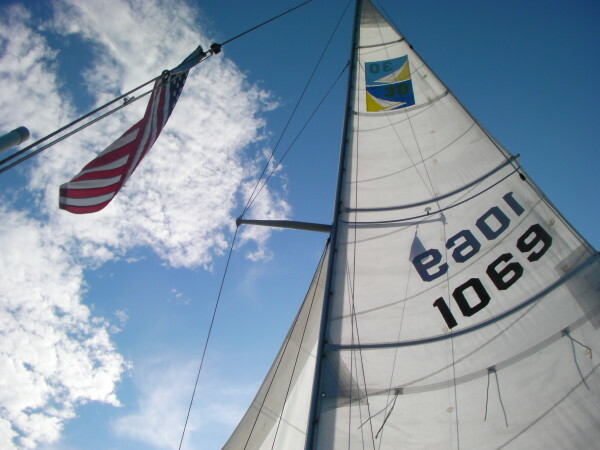 We were beating to windward, about 40 degrees off the wind, and only making about three knots over ground. We didn’t get very far that first day, as I kept having to find closer anchorages due to our not being able to get there by sunset. 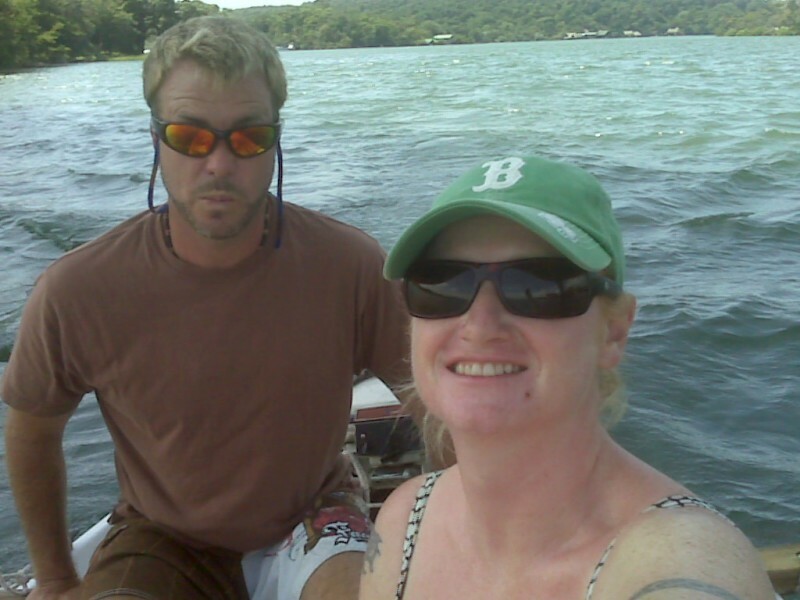 We were motor sailing in 20 knot winds and four foot waves when the engine stopped. Now that really messed up our ETA! Lindsay and I hove to as I when below to check the filter. Not fun. Sure enough, it was clogged. Algae had grown in the diesel tank as the boat was tied to a dock in Placencia for several weeks. I changed the filter and got the engine going again. 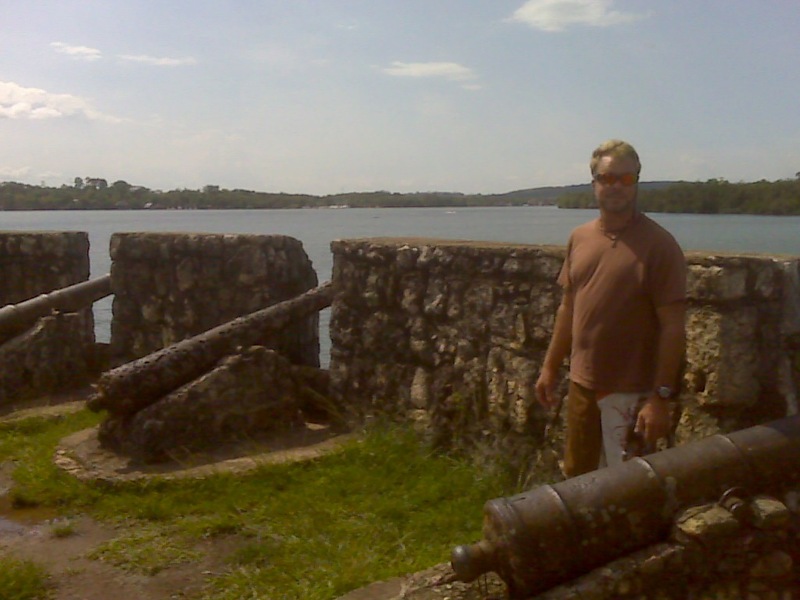 We used the back up plan and headed to a safe place on the mainland called Sapodilla Lagoon. All was good, until the engine died again, right as we were entering the lagoon. Not good. I went below and followed all of the fuel lines. I found a small filter casing in an invisible location. I took a guess on how to open it and removed the black, collapsed filter element. I put the casing back together without the element and bled the fuel lines. She started up again and took us safely into the lagoon. What a beautiful anchorage. A live-aboard sailor puttered over and chatted with us for awhile as we got thing put away. We dined and slept in complete stillness as the wind blew all night. 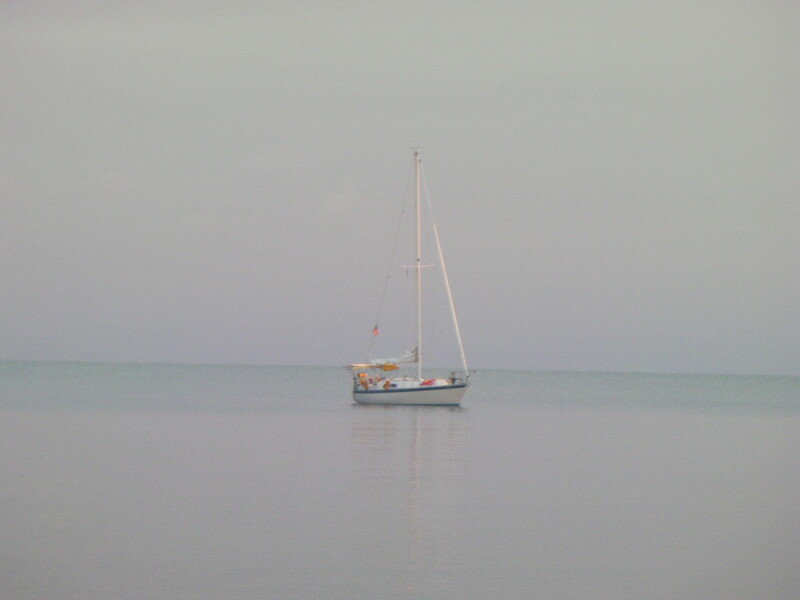 The second day, we were up before the sun and off to Cucumber Beach Marina, just South of Belize City. No fooling around today, we just HAD to get there to meet Peter. 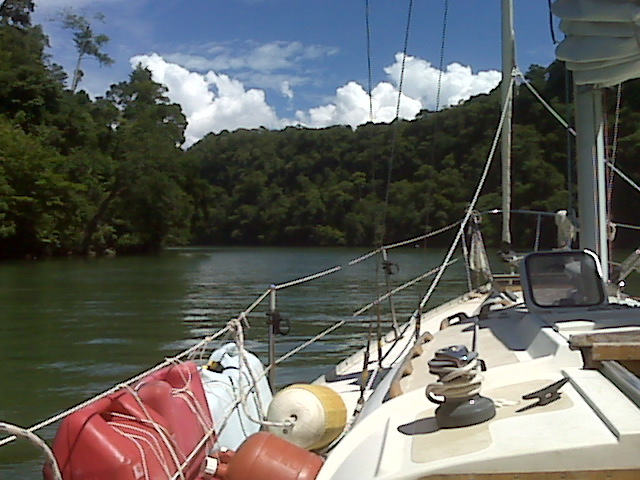 We motor sailed to windward, tacking ever so slightly to keep the boat stable, with the engine running full throttle. We pulled into Cucumber Beach Marina about 4:30 in the afternoon on Monday the 17th. We were impressed with the marina’s appearance. It had an amusement area, lots of boat slips and good help standing by on the radio. The next morning, we were informed that the Coast Guard would not inspect our vessel for a license. Therefore, Lindsay and I scrambled for thought about how to get the boat temporarily imported, and in a hurry. We didn’t want to spend our entire eleven days off dealing with this issue. We went straight to customs in Belize City for our information. While sitting in front of a clearing officer, I opened my “Important Documents” case, felt my heart sink as I discovered that Peter had not returned our boat’s papers to us, and felt foolish for not remembering that I had given them to him about a week prior. (Some other idea about a license instead of customs clearance that didn’t work out.) We most definitely needed those clearing documents to get started. We called Peter immediately, and he arranged to fly the papers to the Municipal airport in Belize City the next day, January 20th, Lindsay’s birthday. Lindsay and I agreed that we would spend her birthday dealing with government officials and the like, so we found a nice Chinese restaurant and a casino movie theater to entertain us. Not much of a gambler, Lindsay got friendly with the local wildlife at the tiny bowling alley and we played a few games until we both managed to get bowling injuries…. who knew that could happen!!?? The bowling alley was much more fun than the casino. Not much else in Belize City, unfortunately. We did meet Ray, the nicest taxi driver around. We called him lots and he always came to get us. We did some power shopping. Fishing gear, kitchen utensils, specialty food items, toiletries, hooray! The good news is, we got a customs broker, talked him into negotiating with customs for us to get temporarily imported instead of fully imported. We paid the rest of our cash for the duty and fees and got out of the marina for a few days off. Before we left, Lindsay was brave enough to go up the mast for me and inspect the anchor light bulb… not a bad feat as she’s scared of heights!! At least she managed to get some nice pictures of Third Aye from the vantage point. It’s about fifty feet to the top. We felt a little pressure to make miles, but had a nice time sailing strong yet favorable winds down the cayes until we needed to be back at the TradeWinds base on January 27th. 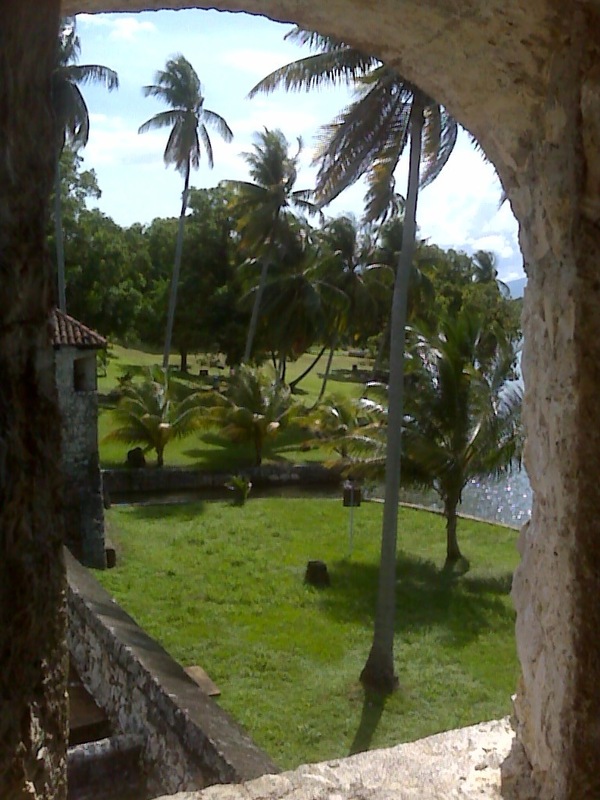 Having explored the ruins and dealt with Customs, we felt that we’d pretty much seen all that Punta Gorda had to offer. With hurricane season luckily still showing little signs of wreaking havoc here, we felt that the cost (quite a lot) of sailing to Guatemala’s Rio Dulce for only a week or two, while we waited on job stuff or head back to Ambergris for the PADI Instructor Course, was not worth the expense… so sadly no seafood, coconut Garifuna soup (we’ll try it one of these days Ian!). So for the first time since Tadd and I met (almost a year ago exactly) we would set sail north! The cold front was still with us, but that meant the west winds were still very gentle, so we decided just to motor a couple of hours away to another of the million-and-one cays and stop for the night. The cay of choice, this time, was South Moho Cay, with a private resort that was purported to welcome cruisers in for drinks and dinner… and who are we to give up the opportunity of a cold beer on an island paradise! But as we approached, it once again looked sadly still out of season. So, we weren’t too disappointed when we tried to anchor and discovered that there wasn’t enough room to let us swing… we were in no rush to repeat the rude awakening of West Snake Cay… so we pulled the anchor back up and kept going… all surveyed by a small audience that had gathered on the dock. I bet they’re wondering what we were up to! So the next best place nearby was the almost-360-degree-protection of the Mangrove Cays. We searched and searched for the promised 17 feet of water to anchor in, and finally gave up and settled for 30–ish feet of water a good 100 yards away from all mangrove covered land masses. We chilled, had a cocktail and listened to some BBC Radio 1 podcasts before dinner, followed by a spectacular sunset beyond the hills of southern Belize, and our next round of Cribbage (our latest favourite distraction). The wind hadn’t picked up by morning, but there was no point in hanging out in the mangroves and the water down there was still all green, murky and generally not at all enticing! So it was back to Placencia. We had a couple of interesting moments feeling our way over and around sandy shoals… sometimes rather too close for comfort! By the early afternoon the wind had picked up a little and Tadd entertained himself with tacking upwind back to the secure anchorage in the mud just off the Paradise Resort and Yoli’s Bar… and back to the fulltime slog of jobhunting. But first we need some water. During the night on West Snake Cay, the almost unheard of in Belize had happened – the winds had shifted to out of the west… and we had swung around to sit on top of the sandbar… and I mean sit! We were ever so slightly grounded. Luckily the sand was soft and tide high enough that shortly after we realized that we were sitting on the bottom, the wind shifted slightly and we floating happily, though with just inches to spare. The cool, overcast day and the prospect of snorkeling in the murky green water, just added to our motivation to leave behind the Belizian boa constrictors (unsighted by us), and keep moving to Punta Gorda. As the westerlies were quite gentle, we motored away before we could get pushed back onto the sand. The skies continued to cloud and darken and we could see rain behind us and off over the mountains, of what we worked out to be Guatemala (it’s always a bit of a mind bender when you can actually see a foreign country across the water). I was determined to outrun the rain, and Third Aye held up her end, as we sped up and slowed down while cautiously passing over numerous shoals. Probably the biggest shock was when we spotted a strange line of colour change ahead of us… could it be a huge sandbar not on the charts?? Nope! Just the milky, brown waters of the Rio Grande and the Rio Blanco mixing ever so slowly, while flowing out into the Gulf of Honduras. Minor panic over, we spotted a few dolphins swimming in the blending waters. From then on in to Punta Gorda we entertained ourselves with trying to identify which of the many bumps and lumps on shore were the different hills on the charts… not so easy… you tell me how to successfully count the seven peaks of the so-called Seven Hills… not as easy as you’d think! With no beaches along the coast here, the town just seemed to sit right on top of the waves. From a far it looked quite nice… but the closer we got the more dilapidated the building seemed. 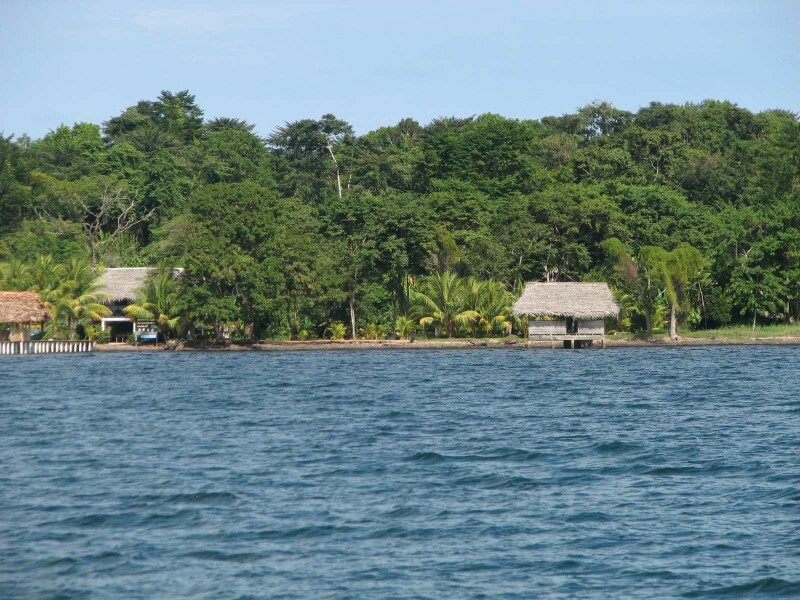 By the time we anchored between the immigration and Texaco docks just offshore, we were definitely planted back in a border town of Central America. Being Sunday, we relaxed and went for a bit of a wander around town, but nothing much more than the internet café (Yay!) and someone to sell us ice were open, so after orienting ourselves around Front, Main, Middle Main and West streets (can you say town planner needed!) we headed back to the boat for the night, ready to check out the tour options and catch up on job hunting the next day. The cold front that had brought the westerly winds made for some very pleasant sleeping conditions… we even had to dig out our blanket!! After many different things that kept us still anchored off the village of Placencia… including no wind… waiting on a friend that was waiting on a fax… and, most exciting of all, an interview with a charter company who has a base here (fingers crossed!! )… we finally managed to pry ourselves away from Placencia (it’s really quite amazing how easy it is to use the days up in a place where there is truly almost nothing to do… we seem to spend most of our time buying food!). Once Tadd had to go rescue a boat load of kids getting swept out to sea by the tide and wind. Sadly, our final delay with the charter company, meant that our friend Englebert had already left for Punta Gorda, by land, the day before and didn’t get to sail with us south and show us his family’s island – Middle Snake Cay. Unperturbed by the light winds we hauled the anchor from it’s cozy spot in the thick, sticky mud and headed southwards. Delightfully the wind picked up as we picked our way between the shoals until we reached East Snake Cay and then on to Middle Snake Cay. 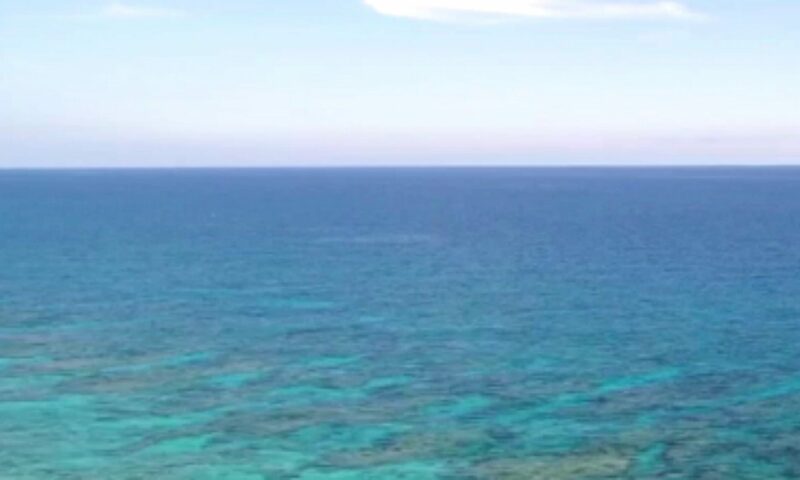 With no sign of the promised moorings off the Cay and no Englebert to offer guidance on anchoring, we decided to abandon the tiny spit of land, that offered next to no shelter from the NE winds and head to the next cay. West Snake Cay… as a rule we tend to shy away from places with names you shouldn’t waste much time pondering their origin! (feel free to ask Tadd about Thunder Bay) But the guidebook claimed that the cays were named for the resident boa constrictors, which tend to be on the very chill, rather lazy side of the serpents and not any threat, and we heard later that no one actually knows how they got there, and so it’s believed that they floated there on some flotsam and now hang out high up in the mangroves waiting for an unsuspecting sea bird to land. So we cautiously dodged around the sandbar to the NW of the island and came in towards what we thought would be a reasonable anchorage. We’d seen a couple of boats on the shore and people swimming, and as we approached one of the guys jumped out of the water, threw on some clothes and whizzed out in his official boat to let us know we were in the Honduras Bay Marine Park and could happily stay for the price of 10 Belize dollars (USD$5). As he gave us some advice on anchoring we felt it fair to pay and spend the night. As directed, we motored all they way in to the pale green water over the sandbar, beyond the deep coral heads we couldn’t even make out through the murky green water (not so enticing for snorkeling as the clear, blue waters further north). With the anchors set, we set about relaxing and enjoying the cocktail hour… until the rolling back and forth of the boat got to us, after a short period of time. The waves coming around the sandbar to the north and around the south end of the island were crisscrossing the wind coming from the northeast were making for some pretty uncomfortable conditions, and that’s without even trying to cook! A handy trick from the Annapolis Book of Seamanship (apparently THE book to end all books on handy boat stuff) and Tadd had us literally back on an even keel and we settled in for the night… knowing that if we did slip anchor we’d simply float towards Guatemala and would be awake long before we hit anything…. So it was quite a shock to wake up and see greenery and palm trees off the back of the boat!!! Won’t you take me to.. Monkey Town? After doing all we could to apply for work online and calling a few people, Lindsay and I decided to take some time for sight seeing. She and I had been talking about going to see the Howler Monkeys located on Monkey River, south of Placencia, ever since we read about it in the cruising guide. We asked around and after negotiating a lower price, booked with Ocean Motion Tours. Nice guy. We were scheduled to meet at his office the next morning, October 13th, at 7:45 am. We met our boat driver, Englebert Westby and promptly set off, just the three of us. We were in a fiberglass open hulled lancha about twenty feet long with the all important canvas bimini top and padded bench seats down the sides. We stopped at a local resort and picked up another man, who we found out later was Englebert’s Honduran friend and that he only spoke Spanish which mostly explained why he didn’t speak at all.We sped off South at about 30 mph down the smooth green water and followed the contour of the mangroves. Surprisingly enough, Englebert sped right into a very small gap in the mangroves and took us along a sheltered shortcut to Monkey River. We surprised a few cormorants inside the mangroves as well. Funny how they can’t fly very well while they are still soaking wet, and have to flap exaggeratedly fast and sort of run on top of the water! Silly birds. We spotted lots of Osprays perched on top of dead trees in the mangroves. They were generally unphased by our noisy commute. At one point, he slowed the boat to make some rather tight turns with mangrove roots on either side of the boat, and the branches lightly brushing the top of the bimini. I think he only slowed down to make sure no other boats were coming. He was definitely on it! We popped back out of another narrow pass in the mangrove maze and we were again at sea. 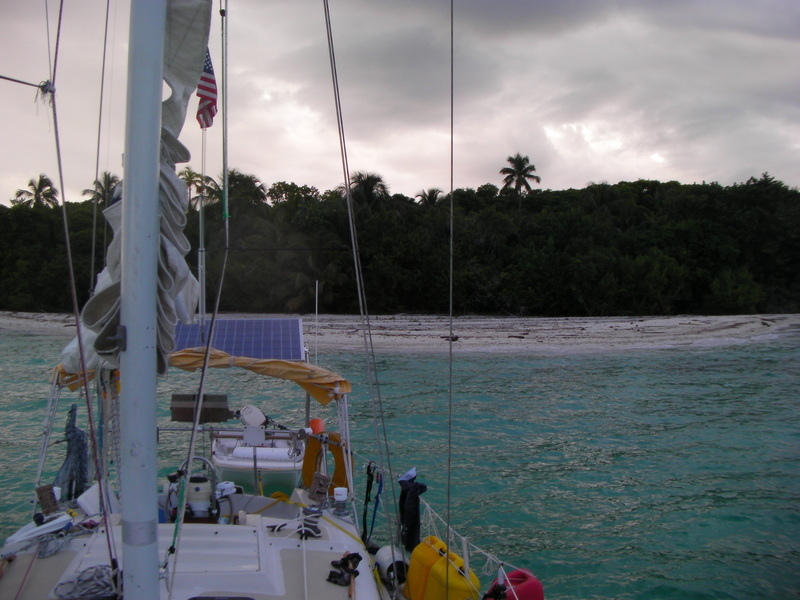 We recognized “No Name Point” from our navigational charts, and Big Monkey Cay. We were very close and arrived much sooner than we had planned for. Seems us sailors just can’t get used to the power boats ability to make lots of way.They water turned the color of coffee with cream as we went full speed over the sand bar at the entrance to Monkey River. There was a green sign, just like the American interstate highway ones, that read, “Welcome to Monkey River Town”. We already new it was hardly a town, more like a gathering of some houses between dense vegetation and beach. There were several local men, apparently tour guides and maybe some others with nothing better to do than to watch the tourists come in, sitting on the shoreline. We went ashore to meet our guide, and placed our lunch order at the restaurant for when we returned from the tour. Rice and beans, naturally. We both chose “with chicken” rather than “with fish”, which has turned out to be the safest choice so far while in Belize. If we have ever ordered something that can’t be cooked in the morning and left in a pot to wait to be served, we’ve been sorry. As it turns out, the lunch was quite nice, although twice as pricey as anywhere else. I guess they’ve got the captive audience thing worked out pretty well. Upon boarding the boat and making our way upstream, our guide, Raymond did a fine job of pointing out local wildlife. Since many species prefer to remain in the same types of habitat, he knew right where to look. Lindsay also did a fine job of pointing out local wildlife and comparing it to the rainforests of Equador. It didn’t seem to bother Raymond at all. We finally went ashore, into the marshy forest amidst hundreds of crabs. Large ones. Raymond was busy looking up and down and chopping occasionally with his machete. He picked up crabs, we tasted different vegetation, and crossed a pool of water using a fallen tree. He clanged his machete on trees and gave out a loud “Wooooooooouuhh!” holler, trying to get a response from any nearby Howler monkeys. 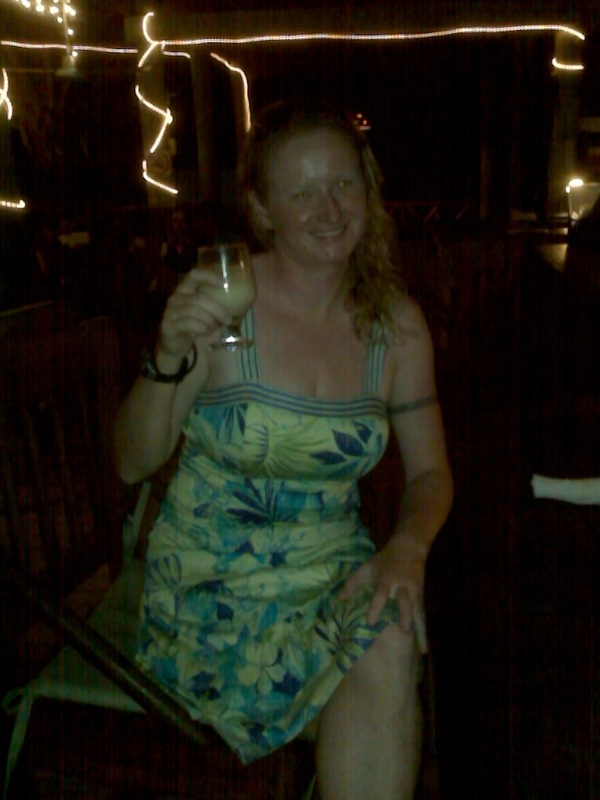 Finally, after the mosquitos were about to drive us mad, we heard one. He was right above us. Very cool. Raymond continued to evoke the young male to grunt for us by making his “wuh”call and shaking the tree on which the monkey was perched. He certainly did get agitated with Raymond’s attention to him and responded by urinating in his general direction. Unfortunately, I missed the shot on video, for I was doing the same thing, just not at Raymond. I did get quite a few minutes of video nonetheless. We had a nice time and made a good friend in Englebert. In fact, we had dinner with him that very night. Can You Say Chill ? 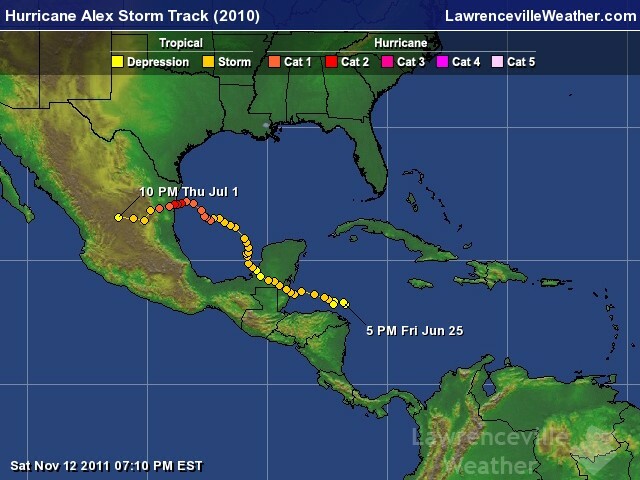 We’ve been in Placencia for a few days now… wow… make that 4 days!! Not quite what we’d planned… but there must have been something about this sleepy little place that has sucked us in. We stopped by to check out the local charter companies for the chance of work… but we pretty much did that last Friday. Maybe it has something to do with discovering the funny little Seranade Bar and Hotel with it’s cheap happy hour and funny Ruddy the singer who entertained us and our new-found friends on Thursday? Or maybe it has to do with being a little hungover on Friday when we started our jobsearch? Actually I think it has something to do with the presence (previously mostly unseen) of the rainy season. Oh… and the lack of wind that seemed to accompany the rain clouds. And then, just when we were definitely leaving the prospect of a potential job, and knowing that as much fun as checking out Monkey River Town and it’s river full of wildlife, it would leave us without internet, and therefore communication to most of the world. So, one day turned into another, and then yet another… with it’s tie to the internet cafés in this, to be honest, overly chill town filled with glazed-eye rastas and crazy ladies trying to sell you the worst coconut macaroons ever, not to mention the fact that, presumably due to the lack of tourists, most things are closed or only open sporadically on their own, mysterious and indecipherable schedule! So… ok… one more day spending money on the internet for the sake of gainful employment….. JUST ONE MORE!